Fast and funny Trudeau and Levesque takes to the stage in Toronto. I’ve long been told that I needed to see a VideoCabaret show, and upon watching last night’s performance, I now know why they come so highly recommended. Trudeau and Levesque is a colourful, entertaining look at politics in Canada in the 70s and 80s, and worth watching whether or not you’re interested in the political scene. Trudeau and Levesque is the second show in a series (the first being Trudeau and the FLQ, also currently running at Soulpepper) about former Prime Minister Pierre Elliot Trudeau (splendidly played by Mac Fyfe). This show dramatizes the period between 1971 to 1982. Specifically, Trudeau and Levesque details the rise of Réné Levesque (played by Richard Alan Campbell) and the Parti Quebecois, the wild partying ways of Margaret Trudeau (Aurora Browne), the first separatist Referendum, the repatriation of Canada’s constitution, and all of the behind-the-scenes intrigue of FLQ informer Poupette (Linda Prystawska) and PQ Minister Claude Morin (Craig Lauzon). Needless to say, it covers a lot of ground. Trudeau and Levesque is presented at a dizzying pace, with 120 scenes in two hours, plus intermission. Most of the cast plays multiple roles, performing an astounding number of colourful quick changes and conjuring up seventy 70s characters, from Mick Jagger (Craig Lauzon) to Jean Chretien (Aurora Browne). 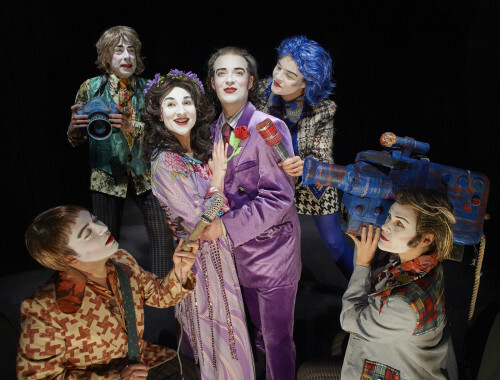 All are presented in highly stylized, clownish makeup, with completely white faces and bright red cheekbones. Performances are accompanied by 70s rock music (highlights being Guantaramara and the Rolling Stones) and live video projections on a screen placed in front of the performers. This also serves as their set, with projected borders and news headlines giving context to the scenes. I was a tad worried that I might be lost in the plot because I hadn’t seen the first part of the series, and because I don’t know all of the details of this particular time period in Canadian history. (I think parts were covered in my high school history class, which was longer ago than I care to mention). While I’m certain that some of the finer details were lost on me, my lack of background knowledge didn’t hamper my understanding or enjoyment. Trudeau and Levesque was fantastic on multiple levels – it looked beautiful, it was funny, it was educational – and I now know a lot more about that period of time in Canada than I did previously. I’m thrilled to join the scores of people who recommended watching a VideoCabaret show, as their performance definitely lives up to the hype. The show dates and times vary, please see the performance schedule for more detail. Tickets start at $26 and can be purchased online , or the box office at 416-866-8666 or visit in person. Photo of Cyrus Faird, Richard Alan Campbell, Aurora Browne, Mac Fyfe, Michaela Washburn, Linda Prystawska by Michael Cooper.